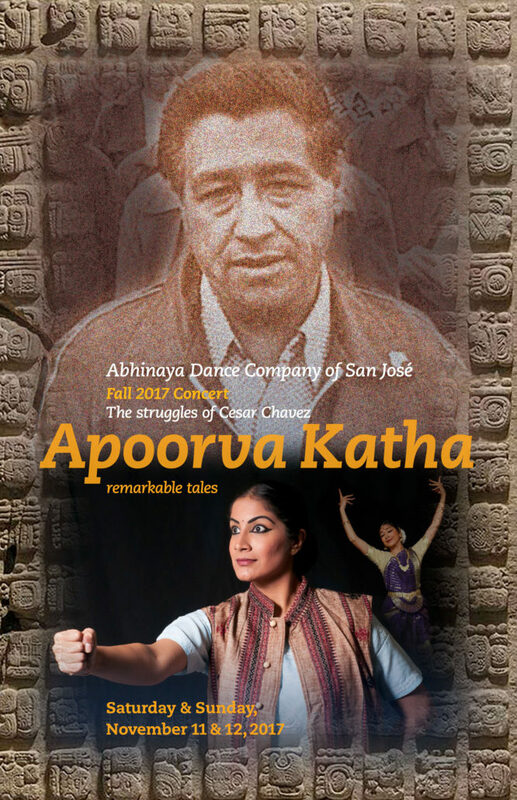 For its Fall 2017 production, Abhinaya presents Apoorva Katha, premiering the story and struggles of Cesar Chavez in the classical Bharatanatyam idiom. This will be preceded by traditional dramatic pieces depicting varied stories from Indian mythology and literature. In May 1995 to commemorate the 125th birth anniversary of Mahatma Gandhi, Abhinaya presented ‘Gandhi-the Mahatma’. In this show, Mythili Kumar presented a brief solo work based upon Cesar Chavez’s farmworker strikes which had been inspired by Gandhi’s non-violent civil resistance movement. Building upon this work, the company presents vivid portrayals of Cesar Chavez’s life, his struggles as a farmworker, his awareness of Gandhi’s non-violent principles and his leadership through forming the United Farmworkers union fighting for the rights of the farmworkers.